One of the activities I spend a lot of time doing here in southwest France is bicycling. The trails are comprehensive, well-maintained, and flat, which is ideal since I have a cheap commuter bike and not a sleek and speedy road bike. During the several bike rides I’ve taken, I’ve marveled at the rows of tall, skinny pine trees that every so often give way to a vast, open field of shrubbery and grass or the Atlantic Ocean, like in the photo below. They are part of what makes the landscape of this department of France, called Landes, stunning and also slightly creepy. (Creepy at least to me, as forested areas make me feel like a bit trapped. On the other end of the spectrum, I also am unsettled by beach towns without trees, so I think I’m just strangely particular). 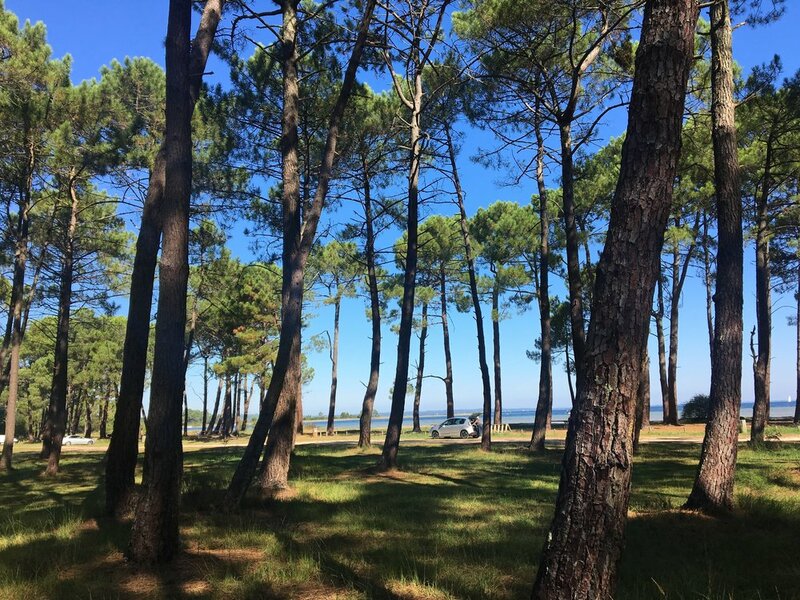 Biking around here is a fascinating view of a truly distinct region, a mix of massive pine forest, sandy beach, lakes and the Atlantic Ocean. On the first full weekend I was here, a teacher at the school where one of my roommates works drove us out to the Dune du Pilat, which is the biggest sand dune in Europe. She told us as she was driving us back home that the Landes Forest, which covers most of the Landes department, was planted during the reign of Napoleon. 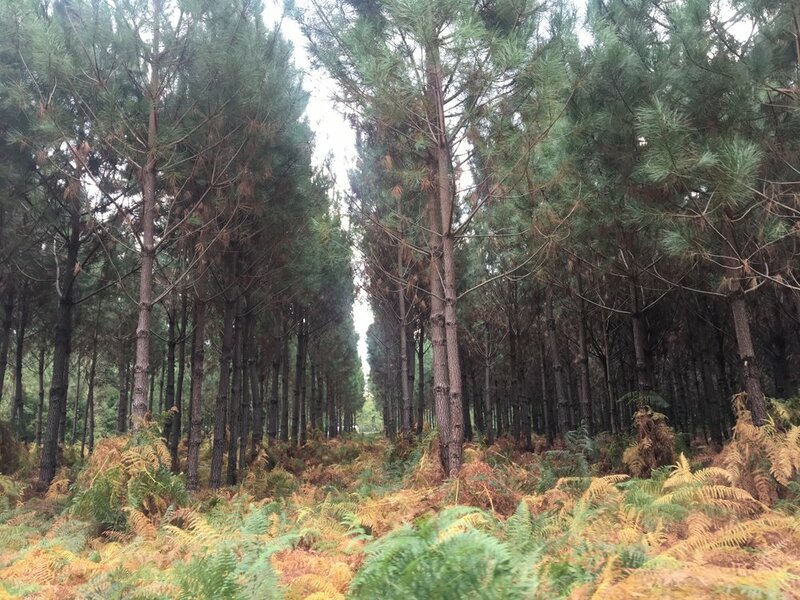 I had never heard of a manmade forest and I wondered if I had understood her correctly, since my French comprehension is definitely not perfect. The signature maritime pine of the Landes Forest. But indeed, as I found out from looking online, the trees of the giant Landes Forest are not natural to this region. This area was once open sandy and marshy land that people had to traverse in stilts because it was so wet and muddy. In the 1800s, private enterprise, individuals, and the government drained the marshes and planted the distinct pines, a process that is described in fascinating detail in this article. The forest quadrupled in size, which has had the unintended consequence of helping make Bordeaux wines as good as they are. According to an informative article in Vinepair, the Landes, which lies between the wine country and the Atlantic, protects vineyards from gusts of salty wind. So the region benefits from the moderating effect of the ocean without having to deal with salt erosion. A camper and a tent at a camping area that is most definitely much busier in the summer. Biking around has given me an appreciation for the distinct mix of massive pine forest, sand, lakes, and the Atlantic Ocean. Since there isn’t a lot going on where I live, especially on Sunday, when even the two large supermarkets close at 12 and the only thing open is a couple of enterprising restaurants, biking and learning about the region has been a natural way to spend my time. Every so often I even come across livestock, like the sheep below who were in the large yard of a house near the town of Sanguinet. Before the Landes Forest ushered in the logging industry and helped make this area more habitable and well-off, sheep herding seems to have been the main industry. Before the “afforestation” of Landes, shepherding sheep was the biggest industry.